The past two weekends, Kim and I have been taking a course to become PADI certified open water divers (a course offered at Diver Dan's). Last weekend was a combination of classroom work and getting a feel for things in a pool. 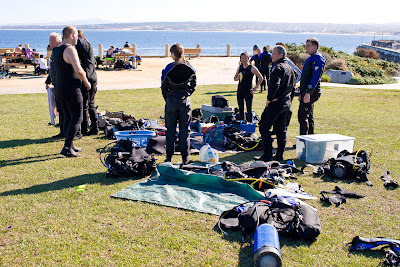 This weekend we had the chance to do 4 dives (2 on each day) at Breakwater Cove in Monterey. It was a pretty grueling experience but in the end I think it was worth it and I find swimming along the bottom of the ocean to be quite relaxing. During our dives a few things I managed to see were: many varieties of Sea Anemones; a couple of Nudibrank, including the Spanish Dancer; a couple of different types of fish including a small Halibut; lots and lots of starfish; and a large dead sea lion. With the busy schedule, I only had the chance to take a couple of pictures. I'm also hoping that as I gain further experience diving, I'll get comfortable enough to hold other gear in my hand (like an underwater camera). Technical Specs: Canon 1D3, 35L, f/4, 1/800s, ISO 100.